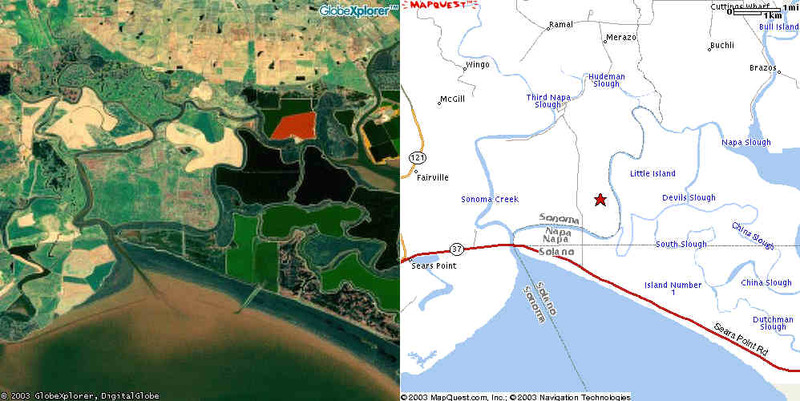 Source of photos and maps: Mapquest (color) and Terraserver (monochrome and topos). Provides receiving facilities for point-to-point, ship to shore, local harbor and inter/intra-district communicators; provides high frequency direction finding for use in search and rescue operations and provides communications support. 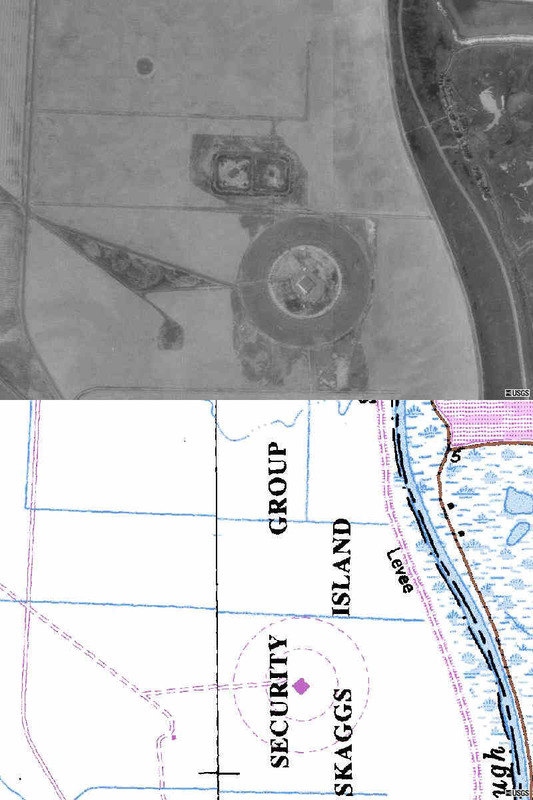 In 1941, the United States Navy purchased 3,310 acres of the island for military use, and developed 60 acres on the north end of the island as a cryptologic communications installation known as the Skaggs Island Naval Security Group Activity. The facility was self-sufficient, with its own domestic water and sewer systems. 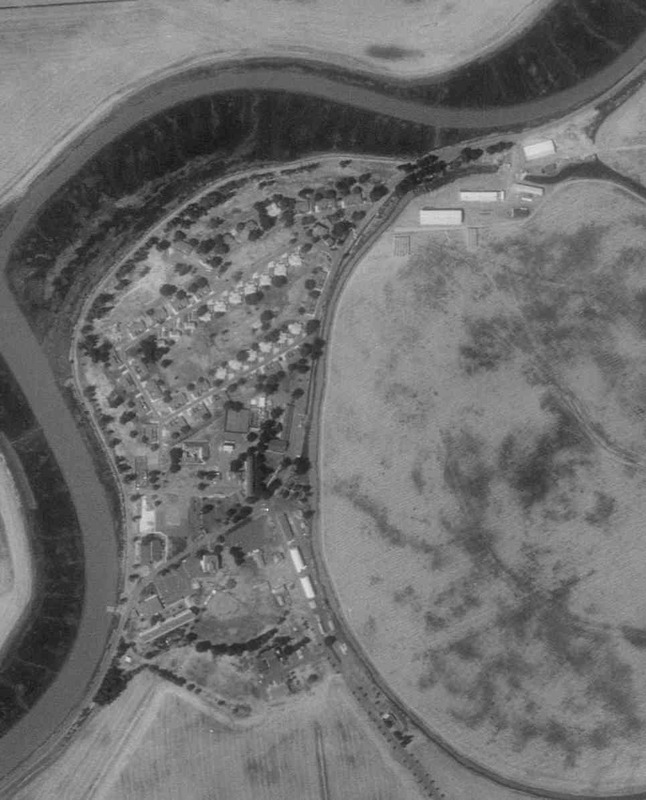 When the base was closed in 1993 under the Defense Base Closure and Realignment Act, the Navy left behind facilities including over 100,000 square feet of office and classroom space, 80 duplex family residential units, a dormitory and food service facilities, and several dozen maintenance or recreation structures. 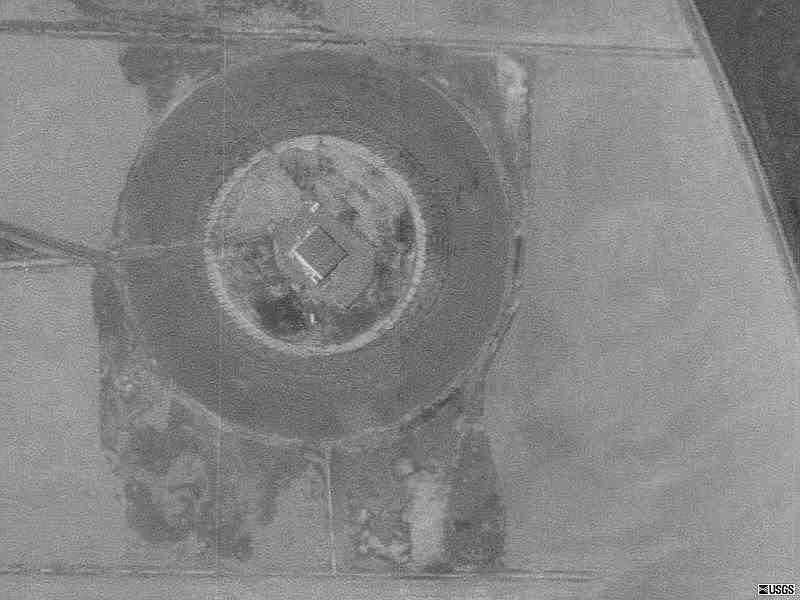 Even though the base is officially closed, the Navy continues to operate a high frequency, direction-finding antenna facility and communications and training facility for the Department of Defense. The Naval Security Group Activity Skaggs Island performed cryptologic functions in accordance with operational and technical guidance and instructions from the CNO, CINCPACFLT, DIRNSA, and CONMAVSECGRU. These include instructional activities of the BULLSEYE Net Control System (NCS) school. 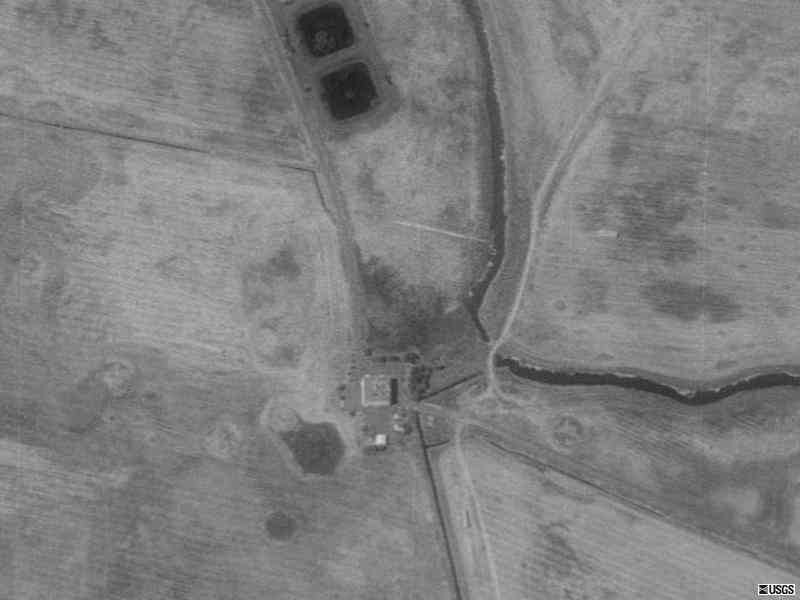 NSGA Skaggs Island was also a node in the TACINTEL subsystem used for transmission of special-intelligence communications. TACINTEL is a computerized message processing installation that makes it possible to transmit and receive message traffic via satellite in a controlled environment. 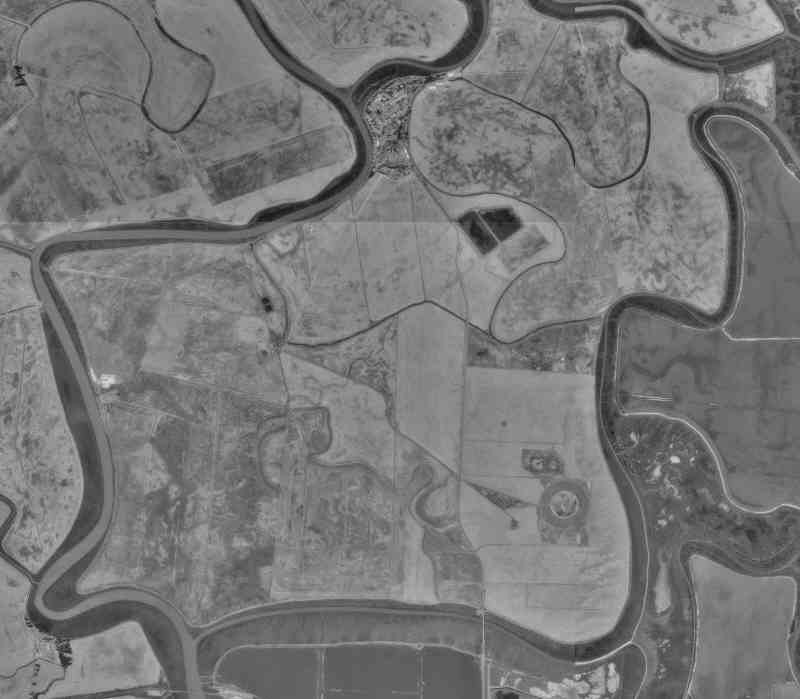 Skaggs Island, off Route 37 in Sonoma County, has been voluntarily phased out by the Navy. 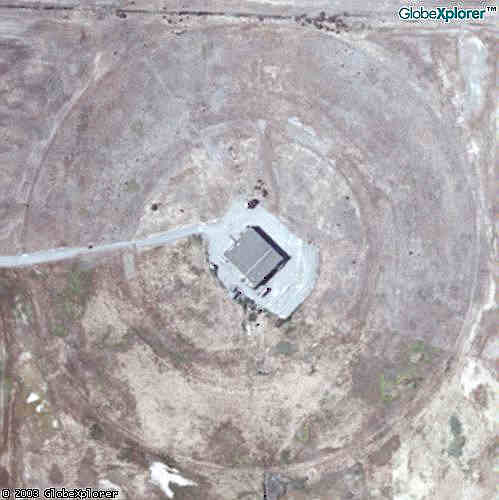 The TACINTEL subsystem at the facility is used for transmission of special-intelligence communications. The subsystem is essentially a computerized message processing installation that makes it possible to transmit and receive message traffic via satellite in a controlled environment. 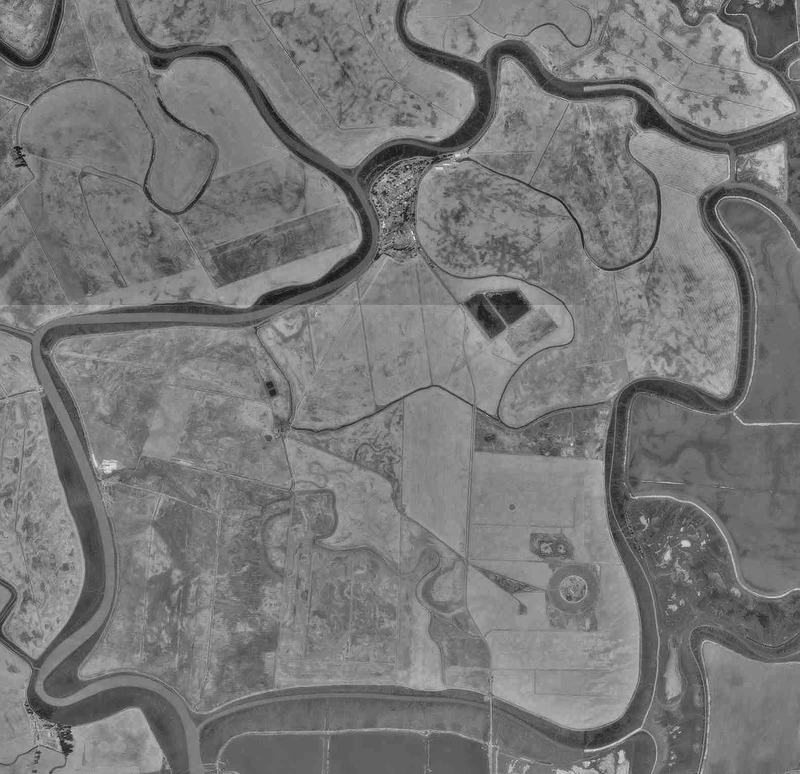 Skaggs Island is a drained area of San Pablo Bay tidelands forty miles northeast of San Francisco. 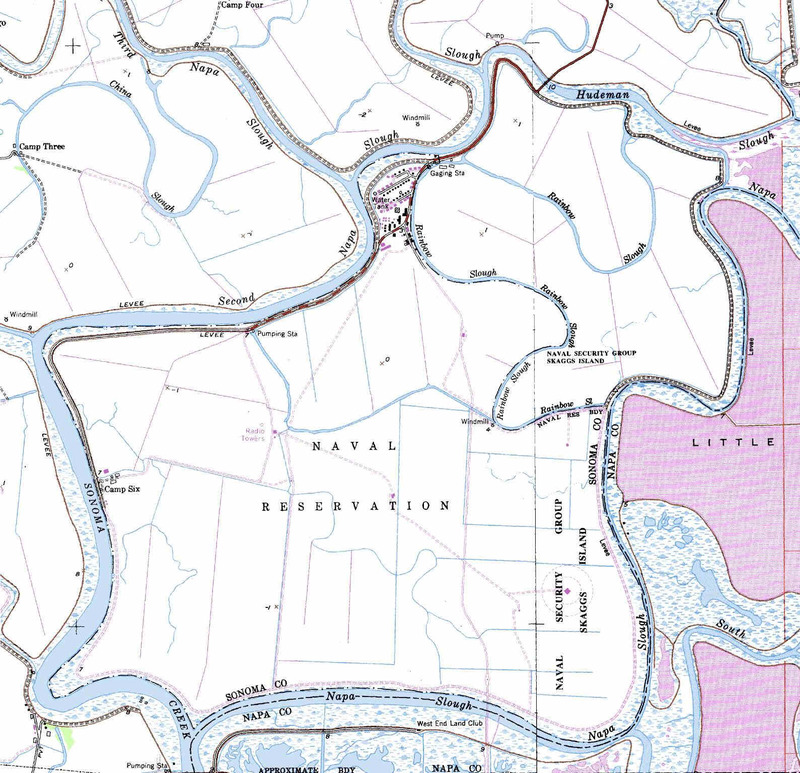 The Navy developed the northern sixty acres of Skaggs Island as a self sufficient communications base with it's own domestic water and sewer systems. Facilities include over one hundred thousand square feet of office and classroom space, eighty duplex family residential units, a dormitory and food service facilities, and several dozen maintenance or recreation structures. 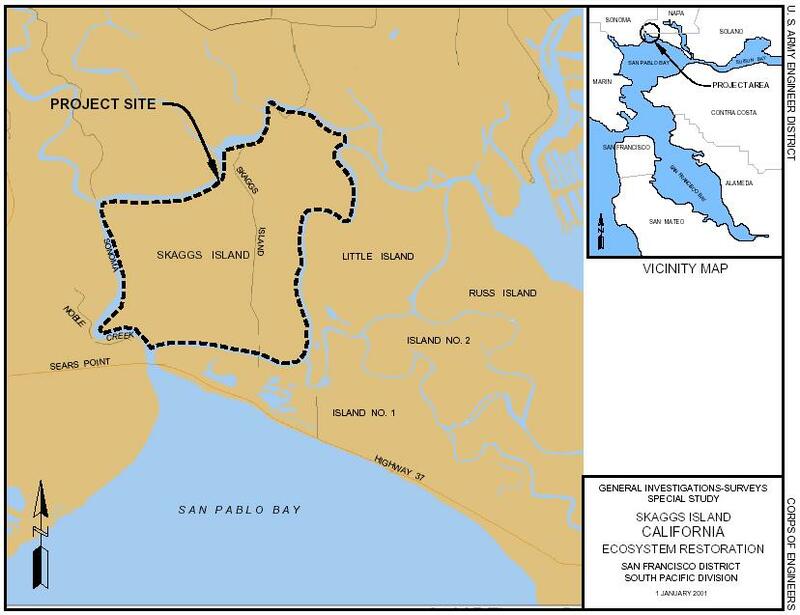 In response to the closure of Skaggs Island a consortium of public and private environmental, educational, and cultural institutions formed the non-profit Skaggs Island Foundation to plan the reuse of Skaggs Island and to serve as the lead agency in the acquisition and management of Skaggs Island for public use. The model for this foundation is the Ft. Mason Foundation which manages the facilities at Ft. Mason in San Francisco. It was Christmas, 1960, when I finally found the lost Soviet submarines. It happened by accident. I had been hearing a scratchy sound for some time on various monitored circuits, but had passed it over as some kind of an anomaly, a spurious emission ... whatever. It was sort of like a burst of static ... but not quite. Then, one day, I made a sonograph-enlarged picture of another signal that happened to have one of these scratchy sounds almost on top of it. Years earlier at Skaggs island what we did primarily was to record and analyze Soviet radio transmissions. Everything was signal coded, naturally, so the trick was to break the signal codes in order to read the Soviet military or diplomatic or whatever type of correspondence. In the process we used what was called a sonograph machine, which utilized a large drum around which a photographic type of paper was hand wound by the operator for each signal to be analyzed. On playback of a recorded signal, the structure or positive-negative bauds of the signal was imprinted and enlarged for inspection by the analyst. That work required 20/20 vision and the patience of Job. Once we broke a signal code, which entailed figuring out from the baud formations their equivalent letters in the Russian Cyrillic alphabet, we sent this information to the National Security Agency. NSA engineers were then able to construct machines that could read out these messages just as did the Soviet machines. When NSA began to read Soviet traffic in volume, they passed on relevant excerpts to military or political end users. Good information could not be obtained over long periods of time. Like ourselves, the Soviets changed signal codes frequently. Then it was back to the drawing board and start all over again; vital, boring work. It was the sonograph machine that enabled me to locate and analyze the scratchy signal. I spread it out and took a closer look. Ill be damned! It had bauds! Tiny bauds; the most compressed signal that I had ever encountered ... but bauds. It was a man-made signal, and it obviously was not one of ours. Gotcha! It was a burst signal, and it had to be a Russian sub. It just had to be! We fired the recording directly to the National Security Agency, and they were ecstatic! All was forgiven. NSA put their best analysts on it and instructed us to concentrate on obtaining as many recordings of this new signal as possible. And suddenly we (and other Naval Security Group intercept stations) began to find them all over the spectrum. Scratchy signals were music to our ears ... now that we knew what to listen for. As we obtained better recordings, I measured them carefully and deduced that the signal had a trigger heading, probably meant to activate a Soviet recording device. The trigger was a series of bauds at 345 cycles per second, followed by a series of bauds at 142 cps. Next came the obvious text of the message. NSA confirmed our suspicions shortly. The subs were back! They had, of course, been there all the time.